It is commonly assumed in popular culture that the “thin ideal” is responsible for causing Anorexia Nervosa (AN). In other words, girls develop AN by embarking on an extreme diet in attempt to look like their favorite celebrity, and if we just showed “real women” in the media, AN would become obsolete. There is no doubt that the ideal female body is much too thin and unrealistic for the vast majority of people. And yes, the majority of girls and women, as well as many men, aspire to be thinner and attempt to diet in order to lose weight. But the thin ideal plays a different, and more peripheral, role in AN than most people think. The thin ideal does not cause AN. Contrary to popular belief, AN has existed for centuries, long before television or internet or fashion magazines, long before thinness was associated with attractiveness or health. Girls do not “become anorexic” in order to look like supermodels. Many girls have tried to “become anorexic” and failed. You cannot choose to “become anorexic” any more than you can choose to become schizophrenic or autistic or epileptic. It is impossible to develop AN if you do not have the genes for it. Dieting, while ubiquitous in American society, does not cause AN. In fact, it’s quite the opposite – dieting reliably predicts weight gain. At least 95% of dieters regain all of the weight they lost within a few years, and research suggests that the rise in obesity in recent decades is at least in part the result of repeated dieting. •	It delays diagnosis and treatment. Since the population is so consumed with dieting and losing weight, children and adolescents in the early stages of AN are usually praised for their willpower around food, for their strenuous exercise regimens, for their avoidance of “fatty foods.” Parents, friends, and even pediatricians will commend kids for losing weight and compliment them on their slim appearance. In their own zest for thinness, adults seem to have forgotten that it is neither normal nor healthy for a child or teenager to lose weight. In this “thin is in” culture, a patient’s AN is often not recognized until he or she is emaciated and visibly ill. By that point, the illness is very entrenched and treatment is much more difficult. It would save so much time, energy, suffering, and money (yes, money) to diagnose and treat AN at its first manifestation, before it spirals into dramatic weight loss. •	It prevents full recovery. Clinicians often set a target weight range that is much too low for full physical and mental recovery. Eating disorder thoughts and behaviors, as well as the associated anxiety and depression, begin to melt away only when a patient has reached and maintained his or her unique optimal weight range. Clinicians themselves are often so afraid of weight gain that they settle for, or even worse, actively encourage patients to stop at, a “low normal” weight. We seem to have forgotten that there is a natural diversity of body sizes. Some people are genetically built to be thin; others to be average; some to be muscular; some to be stocky; some to be large-framed. Each individual is optimally healthy at his or her ideal weight range. Recovering patients who have reached that magical BMI of 18.5 (at which they are no longer considered “underweight” on the charts) are often complimented for their thinness, which is considered desirable and attractive and healthy. The thin ideal feeds into patients’ disordered belief that they should maintain a “low normal” weight even if their own body is healthiest at a higher weight. 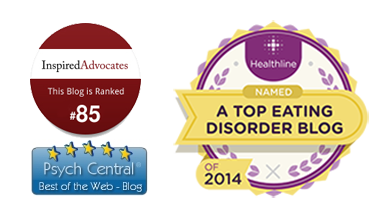 •	It exacerbates patients’ suffering. The ever-present chatter about diets and calories and weight loss and exercise programs creates an unhealthy environment for recovery. When the vast majority of the population is trying to eat less, exercise more, and lose weight, it exacerbates the suffering of a patient who has received doctor’s orders to eat more, exercise less, and gain weight despite her compulsive urges to do the opposite. Patients who do achieve their healthy weight goals tend to see themselves as colossal failures – unattractive, ugly, and disgusting – as they have moved away from the societal ideal that everyone else is striving to achieve. •	It trivializes the illness. As a result of our society’s thin ideal, patients with anorexia are often viewed as vain, superficial, spoiled rich girls who starve themselves for the sake of beauty and fashion. Anyone who has witnessed AN up close will testify that nothing could be further from the truth. •	It creates an environment of fear and guilt around food and fat. Most people these days make moral judgments of themselves and others based on dietary intake and body size. How many times have you heard people say things like: “I was so bad last night – I had 2 cookies” or “I was really good yesterday – I only had a salad for lunch.” Extreme fear of eating and gaining weight is a symptom of AN. So is extreme guilt after eating, or when not exercising. This societal moralizing around food and weight validates the symptoms of AN in its early stages and triggers their recurrence when a patient is trying to recover. If our society’s ideal female body were a plump, voluptuous figure, would AN still exist? Absolutely. Would the incidence of AN be reduced? Probably not. But I believe that patients would be diagnosed sooner, treated earlier, restored to higher (and healthier) weights, and feel somewhat less triggered to restrict after remission. Perhaps the public would also be more apt to see AN for what it really is: an agonizing, life-threatening mental illness that destroys a person’s physical and emotional health. The broader context in which AN occurs would be less validating of the anorexic symptoms and more supportive of full recovery. This entry was posted on Monday, December 12th, 2011 at 5:27 pm	and is filed under Eating Disorders. You can follow any responses to this entry through the RSS 2.0 feed. Both comments and pings are currently closed. I really like this post, Dr Ravin; many thanks! As a longstanding (former) sufferer of anorexia nervosa (AN) I have been trying to argue some of the issues you raise in this post in recent blog posts (e.g. http://extralongtail.wordpress.com/2011/12/02/victims-of-society/). My personal feeling is that AN is a mental illness that merely presents in accordance with the culture in which we live. I developed AN in the 1970s when there was little cultural pressure to be thin. As a consequence, my AN was largely non-fat-phobic. But perhaps if I had been born 30 years later my AN would have presented as fat-phobic. The behaviours would be the same, but the personal ‘meanings’ of behaviours quite different. Great post that highlights the stereotypes surrounding anorexia. I have one question, regarding the claim that ‘It is impossible to develop AN if you do not have the genes for it’…have I missed something, or has an anorexic gene been discovered?! If so, why is psychotherapy offered as treatment, and what does this mean for the possibility of change and recovery? Twin studies have shown that the risk of developing AN is between 50-80% genetic. A 2010 study demonstrated that single-nucleotide polymorphisms (SNPs) in the gene OPRD1 and near the gene HTR1D confer risk for developing AN. So, to answer your question, there is no single “anorexia gene,” but rather various genes that predispose a person to developing AN in the presence of certain environmental conditions, the most obvious of which is an energy imbalance. So people with AN are genetically wired to respond to low nutrition in a certain way. The fact that an illness is genetically inherited does NOT mean that psychotherapy doesn’t work, and does NOT mean that a person cannot recover. The pathway into an illness is not necessarily the same as the pathway out of the illness. We are not yet able to alter our genes, but we can alter our behaviors and environments in ways that are conducive to optimal health, given our unique genetic makeup. For example, alcoholism is largely genetic. However, a person who is aware of his family history of alcoholism can avoid having the disease manifest by avoiding alcohol and other addictive substances, and getting psychological treatment for depression, anxiety, etc. so that he is less susceptible to using alcohol to self-medicate. A person who already suffers from alcoholism can recover with the help of psychotherapy, 12-step programs, perhaps a stay in rehab if needed, building a support network of friends who do not drink, etc. I LOVE this post. Thank you for it. I just have one question. It’s my understanding that while anorexia is a genetic illness, it usually takes a period of being undernourished to start it off. If this is so, it would seem to me that the “thin ideal” could be a trigger that could set it in motion. I believe my own daughter’s illness was set in motion by a diet that she started because of the think ideal. Because she was dieting, she wasn’t getting the calories a 13-year-old girl needs to grow. So couldn’t the thin ideal also be considered a trigger (one of several, including illness, exercising a lot and not taking in enough, growing fast and not eating enough) that sets off a domino effect — dieting and maybe overexercise that eventually brings about the anorexia? To answer your question, yes, the thin ideal may be considered one of many triggers which sets off a domino effect. That being said, I don’t think it is necessarily as much of a “trigger” as people think. In the 1400’s, religion was one of many triggers (along with scarcity of food, rampant disease and lack of medical care, the necessity of expending a great deal of energy on activities of daily living) which sets of a domino effect. Religion was ubiquitous at that time and pervaded every aspect of a person’s life (kind of like the thin ideal today). People passed judgment on sinners (much like they pass judgment on overweight people today). People were striving to be more devout, more Godly, to feel closer to God by fasting. That fasting led to energy imbalance which triggered AN in those who were genetically susceptible. Sometimes I wonder if, back in the medieval times, well-meaning but misguided prevention efforts would have been aimed at changing the “holy ideal,” or encouraging people to become athiests, in attempt to prevent people from developing AN. I believe that AN will manifest in one way or another, and will express itself in the context of the culture in which it emerges. For example, many people with OCD have obsessions and compulsions surrounding germs, in part due to our society’s focus on cleaning products, hand washing, hand sanitizing, etc. I whole heartedly agree with the genetic disposition of having an ED. I developed my ED in High School, continued through college. While I started out as bulimic, the “trigger point” when I became AN was something in my head that clicked and further progressed the disease. Both my parents have addictive behaviors (mom-drugs/ father-alcoholism), I myself realized that my “drug” was the ED. I do wonder what research has been found that relates exposure to the idea of EDs to the rate of diagnosis. When I reflect on my journey, I remember reading many books about it and my unhealthy fascination at a really young age. I don’t believe I could’ve thought up bulimia without being exposed to the idea to use it as a diet method or coping mechanism. It was as if, I already had body image issues without learning it–but methods to “cure” my unhappiness was exposed to me. I think you may be on to something with the “power of suggestion” setting into motion a predisposing tendency. For instance, my daughter at age 12-13 read New Moon magazine for girls, a magazine I love (no ads, girls contribute, etc). 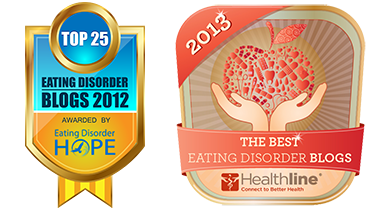 However, I noticed some informational articles relating to eating disorders–and my daughter seemed fascinated by them. She also wanted to respond to letters from girls having eating disorders that wrote in to the magazine. I was rather alarmed by this–especially given our family history. Who could have predicted that a magazine to empower girls could have contributed in any small way to this fascination? I still love this magazine and think it was more my daughter’s tendency than what was written. But, maybe it’s a lesson that even when you try to do the right thing, it can backfire inadvertently. I loved this post, and it came at a perfect time for me. I do, however, tend to disagree with the fact that if we weren’t bombarded with images of emaciated women the incidents of AN would be the same. Those images are very triggering for many people, myself included. I remember when my ED started I was striving to be as skinny as someone I admired. I still do that today, 20 years later. My ED started out as a diet and then turned into this. I agree, not everyone who diets has the genes to develop an ED, but I think a lot of times a simple diet turns into an ED. As for BMI, I don’t know why anyone professionals give that a second thought. It’s a bunch of BS, which I’m sure you know since you’re a smart woman! I completely agree that media images of thin women are triggering for patients with AN, and may contribute to body dissatisfaction for most women. My point, however, is that, in a different era/culture which did not embrace the thin ideal, the incidence of AN (meaning how prevalent it is in the general population) would be the same. It is my belief that patients who are triggered by the thin ideal today would have been equally triggered by religious dictates to fast, or cultural pressures to be hardworking and self-sacrificing and not give oneself enough rest, or the “high” they get from restricting, or a medical illness that causes inadvertent weight loss, or extreme stress from any source, or the hormonal changes of puberty, or any number of other things. My point is that the “thin ideal” is not central to the etiology of AN; it is merely what many AN patients latch onto as the focus of their obsessions and compulsions. Just as OCD patients latch onto our modern obsession with hand sanitizer and cleaning products – these products are not central to the etiology of AN; people with this same brain predisposition, in another area, would have had symptoms with another focus. A period of undernourishment may trigger AN because our hormones etc need a certain balance to keep them in check. Without the correct balance of micronutrients, vitamins and minerals, which must come from food, some people set off the trigger for AN. The AN then takes its own cue from that imbalance. It becomes like an unbalanced see saw (teeter-totter?). Ever seen it with just one child on it? It goes swinging quickly after a very slight momentary period of slow motion down. The closer it gets to the bottom, the faster it goes. Same with the imbalance in the body of the right foods. I feel some people, likely AN sufferers, have a small limit of balance, unlike those who have a massive limit of balance, and therefore cannot become anorexic. It takes me just a few pound off my ideal weight to not get periods, and a a few more for the AN to take hold and swing off on its own. I hope that gives you an idea of why some people, I beliece correctly, state that AN requires a predisposition. I am not sure if it is AN pese, but more a predisposition for a smaller imbalance of nutrients of which AN is a symptom of.